In excellent condition. Non smoking house. Binocular Tripod Adapter Mount BA-168. This enables binoculars threaded for an adapter to be mounted on a tripod for hands free viewing. Brand new/Sealed Came with my husband’s binoculars that I bought him a few years ago and he does not need this. Please let me know if you have any questions. The BA-185 Binocular Tripod Adapter steadies a binocular for clear, relaxed, hands-free viewing. Screws on to binocular between objective lenses (binocular must have a 1/4"-20 threaded socket). Vanguard Camo Optic Guard Binocular Harness > Gets the weight of your neck! 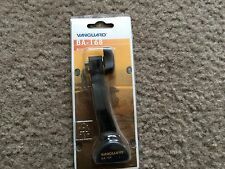 The Optic Guard Binocular Harness from Vanguard is an accessory used to enhance viewing comfort by spreading the weight of your binocular among the back and shoulders. 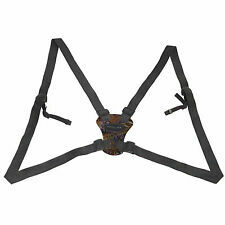 Binocular Harness. Evenly Distribute Binocular Weight. 5 out of 5 stars - Vanguard Camo Optic Guard Binocular Harness > Gets the weight of your neck! 1 product rating1 product ratings - Vanguard Camo Optic Guard Binocular Harness > Gets the weight of your neck! Vanguard Optic Guard Binocular Harness > Gets the weight of your neck! The BA-185 Binocular Tripod Adapter steadies a binocular for clear, relaxed, hands-free viewing. Screws on to the binocular between the objective lenses (binocular must have a 1/4"-20 threaded socket). Not only does this take the weight off your shoulders and arms, it can also allow you to leave your binoculars fixed on a set point, be it a den or a nest, so that when the elusive subject appears, there's no need to try to rush to relocate and refocus your binoculars. The BA-185 allows you to easily mount your binoculars to a tripod for stable viewing. Simply attach the BA-185 to your binoculars and you can easily mount them to your tripod for more stable viewing.